Following on from the last post, an album that compiles some of O.P. Nayyar's earlier songs. Hits the title says, though I wouldn't really know; I'm sure some of them were. There's some ace stuff on it though: The lovely 'Haath Aaya Hai Jab Se Tera Haath Men' (from 'Dil Aur Mohabbat') with its funny Hawaiian sounding break, the happy 'Piya Piya Piya Mora Jiya Pukare' ('Baap Re Baap') with a bit of yodelling in it, the cool and slighty jazzy 'Raat Sard Sard Hai' ('Jaali Note'), the charming 'Too Zara Si Baat Pe' ('Mr. Lambu'), and best of all, the delightfully chirpy 'Chor Lutera Daku' ('Ustad'). Geeta Dutt has a really sweet voice... and you can hear where Nayyar's reputation as the King of Rhythm was coming from. And more. Lots of goodies. As Best Of's go, 'The Magnificent O.P. 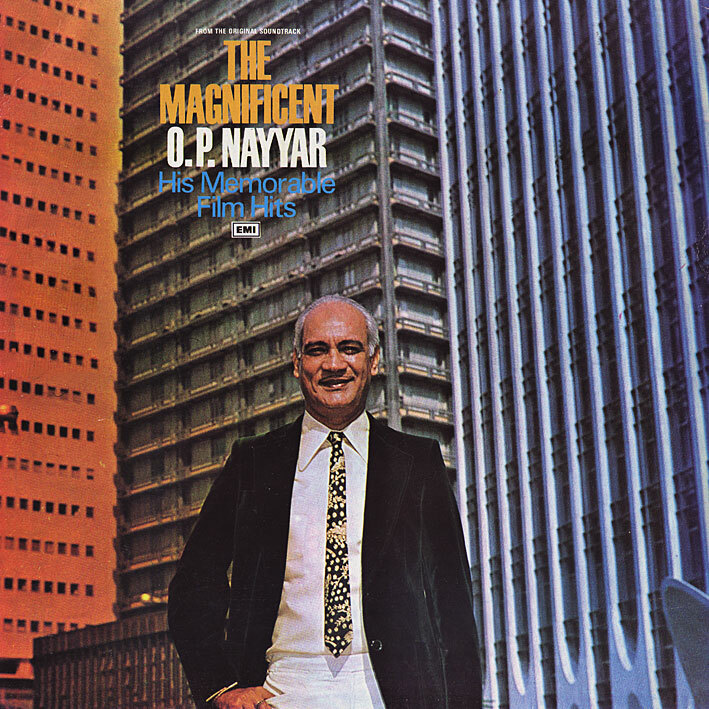 Nayyar' is a swell album. Incidentally, Nayyar was the only Bollywood music director of note to never once utilize Lata Mangeshkar. Funny chap. Here is an article on OPN. There are some error but article informative nonetheless. Forgot to say that one of my favorite things about him is that he always used Geeta Dutt and Asha Bhosle as singers (supposedly he and Asha had a long affair)---I prefer them both to Lata! He also used Mahendra Kapoor more than most, and I love his voice too. thanks - looking forward to learning a new composer! Speaking of MDs. The most impressive was Sajjad Hussain. His last movie was Rustom Shorab (1963). He is considered the most unique, a perfectionist. If you want I can send you the dvd extracted music. Roshan, you haven't covered yet. Here are some more names to look for. There are a lot of music directors that I haven't covered, and won't, primarily because I don't have them. There's no way I'd ever be able to cover the entire scope of filmi music. I suspect most of the ones you mention are of the classical/traditional sounding variety? As many of you will know, my leanings are more towards the 'moderns', ie. the composers who implemented occidental elements into their music... and the ofttimes unique results thereof. I don't mind traditional Hindi/Indian songs now and then, it's just not something I actively look for. And at this point, while I'd still be willing to pick up the odd LP I find truly amazing, I'm actually looking to downsize rather than extend my collection (re. why I started the blog). I do have a couple of Madan Mohan's though, one of which will be up in few weeks. PS. Sajjad Hussain sparked my curiosity... Googled him and found this, in case anyone fancies a listen. This is a cool album! Thanks once again. I have a question (hope you don't mind) - what turntable do you use? I am looking for a new one to play some of my bollywood records but am lost in how many are out there now! I would like one tuned to the unique bad sound quality of bollywood records! Sorry but the link you privided is not original. Turntables: I have a Stanton STR8-50. Also a portable Numark, but I don't use that when ripping.